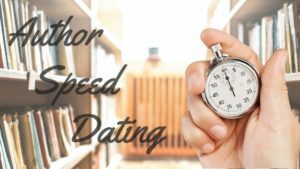 I love discovering new authors, so I wanted my blog to be a place where readers and my author pals could come together. Only we like to do this Speed-Dating style. Check out a new author and her work here every Wednesday, and if the spark is there, you’ll have a match. 1. If you had the chance for front-row tickets AND backstage passes with any band, past or present, which one would you be jamming with? Explain your choice. The Bangles, Destiny’s Child, or the Supremes. As the mother of three daughters and the author of books about “strong women of ALL ages”, I’m all about Girl Power. 2. What is the one thing you wish someone else had told you before you published your first book? That I wasn’t a writer but a storyteller. It took me a few books to fully understand that the words I put on the page and characters I pull from my heart are not mine. They belong to my readers who complete the storytelling process. In other words, my books mean nothing without readers. 3. Keith Urban or Adam Levine? Adam Levine, mostly because I adore the movie, Begin Again. Great music, fascinating characters, and a triumphant story of art and the artist. 4. What are your go-to meals for the final week before deadline? Green smoothies for the win! I’ll boost them with hemp, flax, or chia seeds and mix up texture and taste with everything from avocado and mango to cucumber and ginger. 5. Give the title of the first manuscript (published or unpublished) you ever wrote. What was the story about? The Popularity Game, a 50,000-word YA novel about a nerdy honors student who finds herself transformed into one of the highest rollers in her high school’s “popularity game.” My tagline for this Cinderella story read, “Games are not a reality. They are play. There are make-believe. And in make believe, no one really gets hurt.” Makes me cringe now. 6. Books by George Orwell or Kristin Hannah? 7. At which time of day are you more productive as a writer, mornings or nights, and is caffeine a friend or foe? 8. Which WIZARD OF OZ character were you most like during your junior high years? Junior high? Um, no. Let’s not talk about that. 9. In addition to writing, what are your other outlets for your creativity? Cooking and, more recently, gardening. There’s a surprising amount of creativity required in gardening, like what to do with sixteen heads of cauliflower that ripen at the same time. 10. What type of shopper are you: mall rat, online shopper, bargain sleuth, or none of the above? I’m an aspiring minimalist, so I don’t do much shopping. My goal: to live more with less. Right now I own about 100 pieces of clothing, including shoes. Light feels so good! 11. Have you ever experienced misgivings as an author, and, if so, what are some of the ways you’ve tried to keep those feelings at bay? An agent once told me to make a manuscript “perfect”. This advice sent me into a tailspin. After a period of angst and un-productivity, I realized there is no such thing as the perfect word, perfect turn of phrase, or perfect execution of story. What seemed “perfect” one day didn’t cut it the next. I learned that I must stop tinkering, put the story out there, and celebrate. 12. Scandal or Pawn Stars? Neither. I don’t watch much TV. 13. How many books have you published, and how many are still tucked in a drawer somewhere? Eight books published, including two young adult books, three romantic thrillers, and three mysteries. In a perfect world, I’d stick with one genre, but my heart tells me otherwise. Books in the dungeon: six. I’m fairly certain a few of those beasts will eventually see the light of day. 14. What was the most challenging revision you ever had to make in a manuscript? Developmental edits on my third Apostle book, THE BLIND. In THE BLIND, my heroine Evie Jimenez, a fierce and feisty FBI bombs and weapons specialist, tracks down a serial bomber. My beloved Evie was such a strong, fascinating woman, that she took over the story. The hero appeared in only about one quarter of the book. Not good considering this was a romance! 15. Sure, it’s like picking a favorite child, but which one or two of your titles do you secretly love just a little more? I can’t pick a favorite book, but I can pick a few favorite characters. Favorite villain: The Gravedigger, the serial killer from my romantic thriller, THE BURIED. This villain’s backstory was so heart-breaking that I cried when I learned what turned this particular character into a killer. Favorite heroine: Det. Lottie King from my latest mystery series. Lottie is a hard-nosed homicide detective and a soft-hearted Grandma. She showed up in one of my Apostle thrillers and would not shut up. I finally gave her her own series, which I lovingly call my “Grandma with a Gun Mysteries“. Lottie reached for the shoe box on the top shelf. One shoe tumbled toward her; the other fell behind the shelves. Shelves groaned. Wood split. Shoe boxes trembled. Lottie jumped back just as the shelves careened forward. Bricks loosened and fell to the ground. Shoe boxes rained down on her head and shoulders. The unit crashed to the floor, a cloud of dust and grit peppering Lottie. For poking out of one of the holes in the old brick wall was a human hand. A 2016 release from White Pear Press, NEW SHOES: DETECTIVE LOTTIE KING SHORT STORIES VOL. 2, may be purchased from these retailers: Amazon, Barnes & Noble and Kobo. 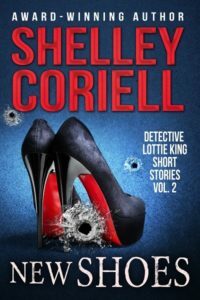 Shelley Coriell is an award-winning author of mysteries, romantic thrillers, and novels for teens. Her debut thriller was named one of Publishers Weekly’s Best Books of the Year, and her other novels have been nominated for an RT Reviewers’ Choice Award, Best Paperback Original of the Year from the International Thriller Writers, and a Kirkus Recommended Read. A former magazine editor and restaurant reviewer, Shelley lives in Arizona with her family and the world’s neediest rescue Weimaraner. You can find her at www.shelleycoriell.com or connect with her through these social-media channels: Twitter, Facebook and Pinterest. Find Dana on Social Media! Copyright © 2019 Dana Nussio. All rights reserved.